And all in the service of a business model built on becoming too big to ban while operating as a regulatory-evasion company! Yep, that sounds like the Saskatchewan Party's kind of business. Which means the only question left is: how much public money will get handed out to allow Brad Wall (or his successor) a photo op? Premier Notley told reporters that her government spent money on infrastructure and services during the recession caused by the international collapse in oil prices, but now that the economy seems to be perking up at last, it's time to alter course. First, it's too soon. The recession isn't over. Spending is still needed to keep the economy off life support. Second, and more important in the Alberta context, taxes here are artificially kept at nonsensically low levels -- too low to run a modern economy in a jurisdiction of this size and complexity -- because we refuse to tax individuals and corporations at a level that makes sense. Everybody understands this. Certainly Notley does, as does her caucus. NDP supporters do too. If ever there was a discredited economic doctrine, it's the harsh austerity, privatization, deregulation, government spending cuts, and lowest-common-denominator trade policies of the neoliberal counter-revolution that has sought to destroy the post-World War II welfare state, which resulted in the highest levels of prosperity in human history, and turn the clock back to the 19th Century. And yet here we go again -- led by an NDP government no less -- down the rabbit hole of neoliberal prescriptions, which never work, always make things worse, and sow chaos and destruction for ordinary people while undermining democracy by making the uber-wealthy richer and more powerful. It's a tribute to the success of the international neoliberal propaganda machine, I suppose, that doing the sensible thing and implementing modest increases to Alberta's taxes is simply not on, even for a well-intentioned social democratic government. Alas, the modest common-sense tax increases Alberta needed from the NDP never came. Instead, the best we can hope for now is compassionate austerity, which when it doesn't work, risks becoming the conservative entrée to something harsher, and even less effective. - And the Equality Trust offers its response to yet another UK budget which inflicts austerity rather than ameliorating inequality. - Noah Smith writes about the crucial role of social redistribution in ensuring the prosperity is shared beyond the luckiest few. And Judy Paul writes that a basic income could go much further in allowing people to make positive life choices like finishing high school as adults, rather than being trapped by the need to scratch out subsistence-level incomes. - Finally, Steven Greenhouse discusses the need for better scheduling protections for U.S. workers - and the developing movement to fight for them. - And Cristobal Young points out that a look at actual evidence strongly challenges the claim that high-wealth individuals will leave jurisdictions with more progressive tax structures. - Nick Hopkins notes that the UK Conservative government is choosing not to crack down ton tax avoidance, preferring instead to inflict austerity measures on the people with the least. And Jim Tankersley discusses a union-led push to test whether corporate tax giveaways will be passed along in the form of wages as claimed by Donald Trump and his band of merry looters (in the full knowledge that there's no plausible reason to think they will). - The Globe and Mail's editorial board discusses why net neutrality is essential for consumer and business fairness, while Colin Horgan writes that the U.S.' policies may have a profound influence far beyond its borders. And Michael Byers makes the case that Canada should ensure the protection of net neutrality as part of its NAFTA bargaining position. - Finally, Jonathan Thompson maps out the U.S.' hundreds of pipeline spills over just the last two years. And Erik Heinrich notes that it's far from clear who will ultimately foot the bill for spills in Canada - and that even pipeline proponents may have no interest in going ahead with projects if faced with the environmental risk. Here, on how the Saskatchewan Party's climate obstruction is entirely out of touch with the province's citizens. 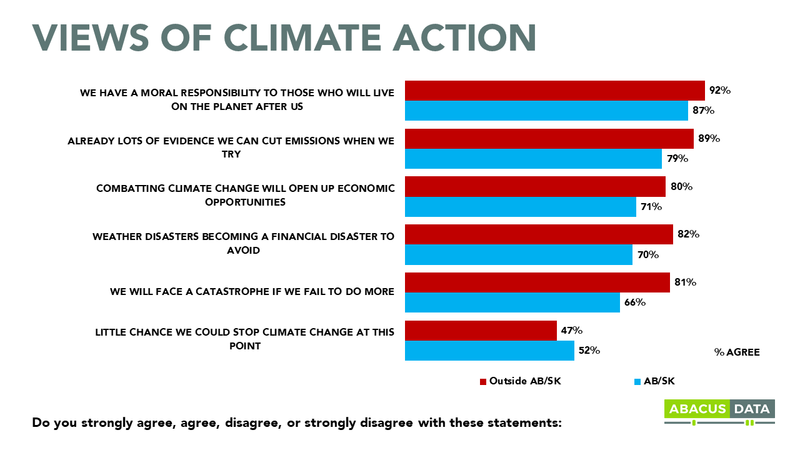 - Abacus Data's national poll of attitudes toward climate change policy is here, with the separate chart pointing out the views of Saskatchewan and Alberta respondents looking to be particularly significant. - And again, James Wilt has discussed the public's appetite to fight climate change here. - Karl Nerenberg writes about Bill Morneau's conflicts of interest - with particular attention to the NDP's justified criticism of legislation aimed at privatizing pension management to benefit forms like Morneau's. And Brent Patterson discusses a push back against the Manitoba PCs' plan to privatize public services through social impact bonds. - Marc Lee comments on the need for investments in British Columbia's public transportation infrastructure. - Donna Ferguson interviews Diane Reay about how the UK's education system is set up to perpetuate social status rather than to give working-class students a fair opportunity to succeed. - Anna Tims reports on the constantly-changing and unmanageable terms of work being imposed on workers in the gig economy. And Sara Mojtehedzadeh reports on the much-needed passage of improved employment standards in Ontario. - Nathan Robinson writes that the left is winning the battle of ideas as U.S. conservatives in particular have stopped having anything constructive to say. - And finally, Tammy Robert highlights the small number of big corporate donors who are exerting disproportionate control over the Saskatchewan Party's leadership campaign. - Larry Elliott interviews Joseph Stiglitz about the rise of Donald Trump and other demagogues in the wake of public anger over inequality and economic unfairness. And Stiglitz also joins a group of economists calling for an end to austerity in the UK. - Phillip Mendonca-Vieira highlights how rent controls provide some needed stability for tenants who would otherwise face a constant risk of housing upheaval. Emily Mathieu and CBC News each report on some of the elements of the impending federal housing plan - though it looks to be noteworthy mostly for falling short of any intention to treat housing as a human right. And Kate Wilson writes about BCGEU's much more ambitious plan to ensure that housing is available and affordable in British Columbia. - Jessica Lindsay discusses the connection between poverty and mental health. And David Baxter reports on new research showing that over 24% of Saskatchewan's children are living in poverty. - James Wilt writes about the widespread public support in Canada for strong action to rein in climate change. And Louise Dickson reports on Michael Byers' suggestion that the corporations who have profited by polluting our planet should be on the hook for the resulting costs. - Finally, Richard Wood offers seven reasons to scrap the distorted results of first-past-the-post in favour of a proportional electoral system. - David Climenhaga writes that Canada needs a lot more of Jeremy Corbyn's critical analysis of an unfair economic system, and a lot less Justin Trudeau-style cheerleading for it. And Bill Curry reports on a new push to cut down on poverty at the national and provincial levels. - Dave Kamper discusses how anti-union actors in the U.S. are focusing on draining organized labour of any ability to push for structural change. And Mindy Isser comments on the importance of deeper organizing to keep workers engaged while strengthening the union movement. - David MacDonald, Cole Eisen and Chris Roberts study how private-sector defined benefit pension plans have been systematically underfunded, resulting in shareholders extracting deferred wages while endangering workers' pensions. When a company makes a decision that is destructive to the environment, for instance, it is not because there are bad or unintelligent people in charge: Directors typically have a fiduciary responsibility that makes the bottom line their only priority. They serve a function, and if they don’t, others can take their place. If something goes wrong — which is to say, if something endangers profit making — they can serve as convenient scapegoats, but any stupid or dangerous decisions they make result from being personifications of capital. The claim here is not that unintelligent people do not do unintelligent things, but rather that the overwhelming unintelligence involved in keeping the engines of production roaring when they are making the planet increasingly uninhabitable cannot be pinned on specific people. It is the system as a whole that is at issue, and every time we pick out bumbling morons to lament or fresh-faced geniuses to praise is a missed opportunity to see plainly the necessity of structural change. All that remain as widely shared, commonly accepted sources of national pride are our public services: the NHS, the BBC, the education system, social security, our great libraries and museums. But all have been gutted, disciplined and undermined by those who roundly assert their patriotism. When the enabling state, providing robust public services and a strong social safety net, is allowed to wither, what remains is the authoritarian state, which must coerce and frighten. Consider the decline of neighbourhood policing – essential for preventing crime and gathering intelligence on everything from vandalism to planned terror attacks – and its replacement with ever more draconian laws. As the enabling state shrinks, the flags must be unfurled, the national anthem played, schoolchildren taught their kings and queens, and more elaborate pieties offered to dead soldiers, because nothing else is left with which to hold us together. National pride becomes toxic, and is used as a weapon against anyone who seeks to express their love for the country by reforming it. The institutions charged with defending the national interest become its deadly enemies. - Jonathon Rothwell examines the connection between sheltered industries and economic inequality. And Howard Gold discusses how the U.S. Republicans are looking to make matters far worse with a tax giveaway to the wealthy. - Meanwhile, Branko Milanovic makes clear that degrowth isn't an option to address global inequality. - Nicholas Kristof highlights how moralistic public policy only tends to lead to exactly the social breakdown it's intended to prevent, while investments in public services allow people to make choices which better suit their needs. - Finally, Umair Haque writes about the dopamine economy which leaves consumers constantly seeking instant gratification. - Brent Patterson discusses how the Libs are putting the hands of their already-dubious "infrastructure bank" in the hands of people with a track record of turning public services into private cash cows. - David Suzuki takes note of another U.S. government climate report on the dangers of climate change. And the Guardian reports that Norges Bank - manager of Norway's trillion-dollar sovereign wealth fund built initially on oil royalties - is recommending a move away from reliance on fossil fuel investments. - But James Wilt writes that Canada is fighting its own evidence as to the effects of oil extraction, arguing that leaking tar sands tailings ponds don't exist even though its own studies confirm their contamination of drinking water. - Warren Bell highlights how a proportional electoral system ensures balance between the views and interests of multiple political parties. - The Star's editorial board argues that Canada's federal government should go beyond reversing the Harper Cons' targeted attacks on charities to clarify that issue advocacy is a valid function. - Finally, Doug Cuthand discusses the racism behind Bronwyn Eyre's desire to segregate Indigenous people and stories in Saskatchewan's provincial curriculum, and her dishonesty in trying to create a basis for that position. And Cam Fuller serves up the non-apology to end all non-apologies - which sadly figures to be used as a template by the Saskatchewan Party in response to outrages to come.